I have been around horses for over 22 years, but my professional involvement started in 1999 when I joined the Royal Armouries (RA) as a Rider Interpreter. I demonstrated equestrian martial arts from the Romans through to World War 1. I have taken part in over 1000 competitive passes along the tilt rail. I competed successfully in the jousting tournaments of the Golden Swan (2000), Silver Swan (2001), Sword of Honour (2002, 2003) and the Queens Golden Jubilee Horn (2002, 2003). During my time at the RA I learnt to train horses using Natural Horsemanship techniques. I was strongly influenced by Monty Roberts, Pat and Linda Parelli, Brian Neubert, Mike Kevil, Chris Cox and Tony Smart. This natural approach helped me to train certain horses at the RA which had been labelled failures under the old cavalry style system. 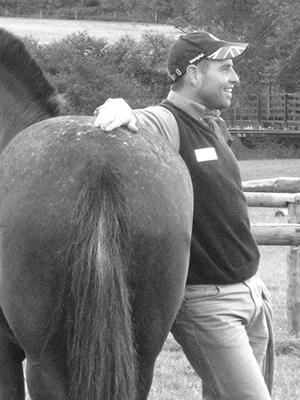 In 2004 I began training horses for private clients including problem solving, starting young horses and riding tuition. The horses I have worked with and are still working with are my teachers. They keep me on the path of truth and honesty with myself. The horses hold up a mirror to me and say look here first. This mirroring ability became particularly clear after I had four sessions of Equine Assisted Psychotherapy. I was really struck by the power and potential of this model which showed me how to work with empathy and to see myself through the horses’ eyes. I am a serving member of the Royal Navy Reserve which gives me an affinity and understanding of some of the difficulties of being in the British Military in the Twenty First Century. I believe that EAP would be of great benefit to service personnel who suffer from the trauma of armed conflicts.